In a period where EVERYBODY carries a knife, you would need to bring a rather big knife to make an impression. Sidearms in a civilian setting is more a question of appearing and FEELING armed than actual use. Another point is that while knifes are fast, they are also so short that you have to step into the opponents range to use them. This leaves you extremely vulnerable to counterattack. A longer blade allows you to strike without making all out commitments. Also with at least 12" of blade, but even more with 15" + blades, some parrying is possible alone or in combination with a sword. Very long dagger and a buckler might also be a viable weapons option although I'm not sure if this was done often ? ( Messer and buckler also something I would be curious about ). From the pics of period art shown in the last few posts it does seem that the long dagger could be used as an alternative to wearing a sword but also some preferred to have both sword and long dagger: Preference based on tactical preferences or in some cases economic/social status reasons. For most of the 14th century big daggers or small swords were the ordinary walking-around-arms of the top half of society. Sword and buckler was associated with commoners, and longswords are more awkward. See the book "Fashion in the Age of the Black Prince". Vadi and Marozzo teach fighting with long daggers. Maybe you shouldn't take that part too seriously. 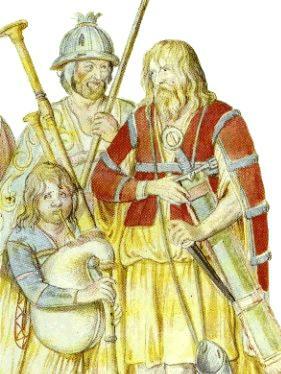 Billmen, halberdiers, and similar types were often armed with swords. English longbowmen (for whom the contemporary term was "archers") were also famous for the sword-and-buckler combination they almost universally carried (at least if we believe the Italian chronicler who mentioned this), and the Continental troop types developed to imitate them (most notably the mounted archers of the French and Burgundian Ordonnances before they transformed into light lancers) were generally required to have long swords. A bit OT, I know. I just can't get over the feeling of weirdness brought up by the notion that Late Medieval archers and billmen wouldn't have been armed with a sword. Just weird, you know. A large part of my point was to challenge whether these notions were supported by fact or simply were modern lines of thought/preferences/reenactorisms. As has been seen, there is plenty of evidence that these notions are not entirely accurate. My experience suggests that a long sword is usually and advantage, as long as single hits have an impact. While shorter weapons are more handy up close, they have to get there first, creating a window for the swordsman to step back and strike. If you are allready up close, this is not a problem. For instance, when you are armed with a polearm primary, and you are rushed by an opponent (HE spends time closing instead of you...) a long dagger is perfect. Once you have scraped him of, however, you will want to go back to your primary, or draw a longer sword, lest you be smacked from afar. Against shorter knifes, they give some edge, as you now can strike against his hands, while he has to step to reach you. This is also quite obvious, and gives you a definite morale advantage. Also, they look cool, which should never be underestimated. Thank you Blaz and Chad for the wonderful pics! They have been a huge help to me in my current long dagger projects. Can anyone help me with some measurements? I have some springs about .25 inches thick and long enough for a 17 inch blade but I fear that may be too thin to match historical examples. Are these blades as beefy as they look to me? And width, is 1.5 inches too wide or should base of blade be more like 1-1.25 inches? Any input would be greatly appreciated. Might that not be appropriate for a single edged blade with a false edge on the point ? In this knightly effigy, he looks to be wearing an extremelly long ballock dagger on his right hip. On his left hip there used to be a sword as well, but it's broken off.
" 40 "horsemen" or knights attending the Great King, "They ride without saddles on a cushion and each wears a cloak according to his rank. They are armed with coats of mail and round iron helmets like the moors and Saracens. Some of them are like the Bernese. They have swords and very long knives and long lances." M van Dongen, was your comment in answer to my question? I was undecided what to do with said piece of material, being too wide for a dagger and too short for a messer. If I cut it diagonally longwise, I should be able to get 2 ELD's with 15 to 18 inch blades, one 3/4 inch wide, one 1 to 1 1/4 inches wide, with 5 to 6 inch tangs. Does that sound appropriate? Chad, I have a quick off-topic question if you will humor me. By "fechtbuch daggers with extra-long hilts" do you mean panzer-stechen/estoc-with-rondels or something else. In my rather limited experience of dagger-fighting, as a dagger-blade gets much longer than 12 inches it becomes less appropriate for some of the locks and wrestling moves shown in fechtbuchs. Would messer techniques be appropriate or would the rondels not provide enough protection in winds when you depend on the nagel. Any thoughts on the use of these weapons in relation to fechtbuch techniques? A dagger with a blade over 15 inches long could deliver some relatively powerful strikes, even without an acute edge it would be kind of like getting hit with a sai. There are some illustrations that show daggers with very long hilts that have been jokingly called "hand and a half" daggers. They are rondel daggers IIRC. The blades are basically normal size, but the hilts are quite long. 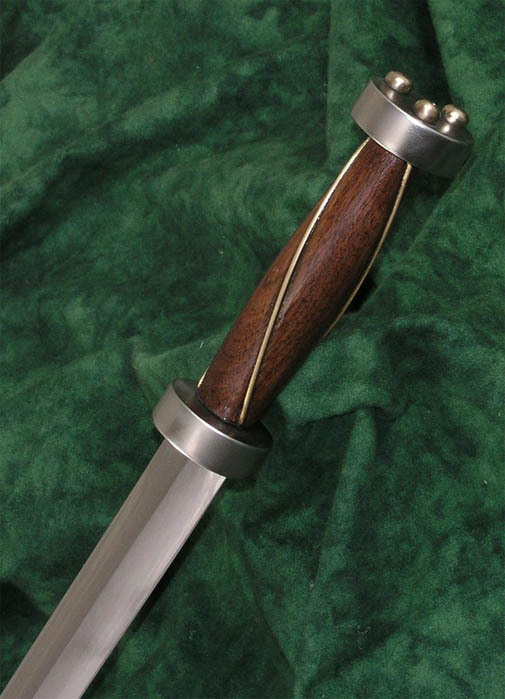 Thank you Chad for the link to the thread on long-hilted rondels. Very interesting. Wouldn't it be cool to do a set of rondel weapons en suite- a short rondel dagger, a long-gripped rondel dagger, a panzerstechen and a candelliere or awlspiess? I have a couple of questions requarding these long daggers. What do the sheaths for these knives look like? Are they just leather or do some have wood cores? I imagine that there could be a lot of variation, so while I am interested in hearing about it all what would have been done in the English-Scottish border area in the late 1500s? Along those lines, when wearing a long dagger why do some people wear theres in the front, some on the side and others in the small of the back? Once again what would have been appropriate on the Border region? I assume that wereing a long dagger in front might get a little awkward when riding a horse. And while I am asking knife related questions. When did the By-knife and Picker get added to the dagger set. The classic Scottish dirk has both attached to its sheath so when did that start to become the norm? Scott- I like the idea of having an entire set of different variations on the same dagger style. I might try that going from Ballocks daggers to Scottish Dirks. Could look cool having the the range a daggers on the wall. Is it a new toy? If so, who made it? Whoa! That original is huge! Maybe the artwork doesn't convey the length as well, because that looks immense. Very cool, and I love the repro. Nice purchase, Chad. Does anyone know about the use of long daggers in conjunction with a single-hander? Aside from rapiers, of course. I think Silver might discuss this, but I'm never sure what he does mean by "short sword." How early were daggers used as parrying weapons with another, longer weapon? It seems to me that a nice long quillon dagger might work very well with some sword and buckler techniques, while adding the capability of doing some damage on its own. Great piece Chad! I love the rivets(?) on the rondel. The wire in the grip adds that little something extra. Post some "in hand" photos if you get a chance. I'd love to get a better idea of the scale of this piece. Congratulations!